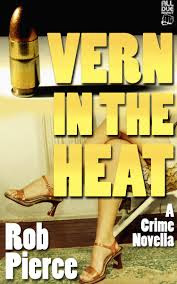 One of the greatest compliments I can afford to Vern in the Heat by Rob Pierce is there is not one single character worthy of your sympathy, not your rooting interest. Why is this a compliment? Because Pierce has written a true noir masterpiece in which every character resides in the proverbial gutter and has no hope of getting out of this tale unscathed. Vern is part of a 2-man operation that performs deliveries for organized crime. When out on one such delivery, a double-crossing goes down and Vern is left in a precarious position; not knowing who to trust nor how to clear his name and avoid certain retribution by his employer. After hooking up with his ex-girlfriend, he sets out to clear his name and, most importantly, keep himself alive. The action gets gritty and violent; just the kind of plot that keeps me interested. This was a nice follow-up to Pierce’s Uncle Dust. Pierce is showing he has a keen eye for plotting and can keep the action dialed up to a high intensity. The only knock I can find for this book is that it was too short, but when a writer can serve up noir like Pierce can, there is never going to be a book that is long enough. I am looking forward to the next pierce offering. If you have a craving for some violent noir, Pierce has a tight novella here that will satisfy your craving.